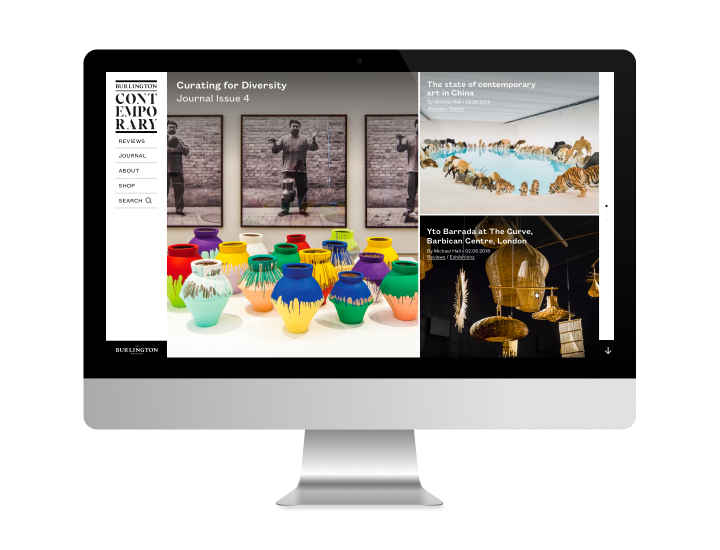 Burlington Contemporary is a new online journal dedicated to new research and informed opinion on recent art. Started in Autumn 2018 by the long-established fine and decorative arts focused Burlington Magazine, this new focus and celebration of the contemporary art world is intended to address the question of how to write art history for art made today. Reviews of contemporary exhibitions are published weekly, in addition to a free access, peer-reviewed academic journal published online three times per year. The design balances delicately between bringing across the Burlington brand, and creating a defined and reputable brand of its own; as well as presenting a forward-looking face chiming with contemporary art. The website is fully responsive across all devices. The fully flexible and varied template layouts vary according to content type, incorporating image-heavy articles, responsive listings for articles, and a lightbox function to enlarge images. Burlington Contemporary is a fully online journal, but its roots lie with a print magazine. The combination between the two is brought into focus by the very movement the user takes through the homepage. The sections ‘flip’ like a paper page, allowing each individual section to occupy the whole perspective of the visitor. The homepage acts as the contents page, and the layout efficiently communicates the content, whilst also striking a good balance between encouraging scrolling and making the order clear. The reviews landing page echoes the homepage, with the two most recent reviews highlighted for the visitor. 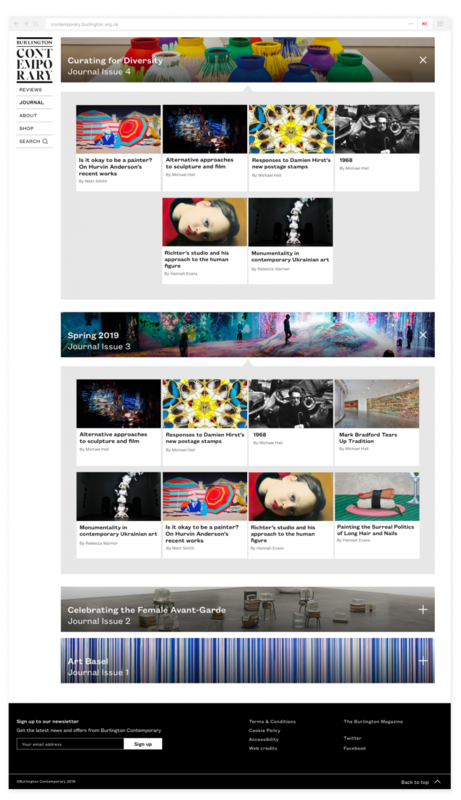 The visitor is able to scroll through the constantly updating content (two new reviews are published each week); as well as choose whether to filter between reviews of ‘Books’ or ‘Exhibitions’. A single review is designed to be dynamic and image led, with the images of the review in a single column to the left of the text. This means the reading of the text is uninterrupted by images, but the user is able to view footnotes and open the lightbox from within the text. When the user lands on the journal landing page, the most recent journal is open in a concertina. These concertinas mean the user does not have to to another page to see the contents of each issue, streamlining the user experience. The individual identity of each issue is clear in context with the other issues. Individual journal articles that belong to a single issue of the journal are designed to be easy on the eye and guide the viewer through the long text. High quality imagery can be seen in detail due to the lightbox function that allows imagery to be enlarged. The lightbox provides the user with a closer look at the imagery referenced in the single article. 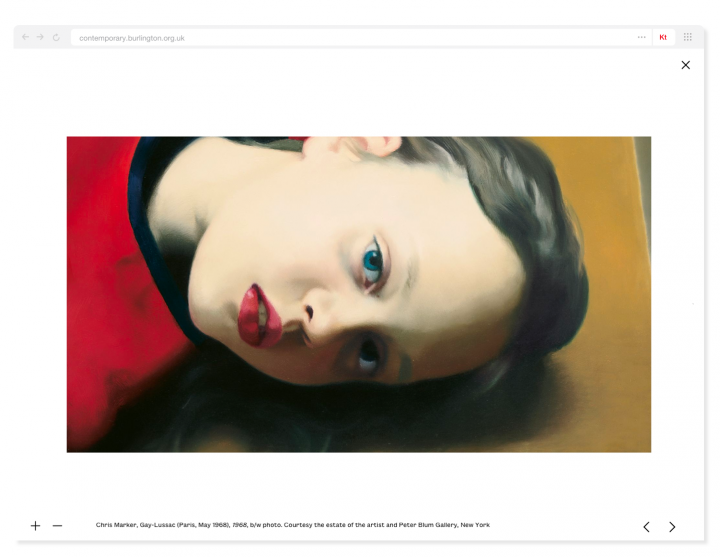 There is also an ‘about’ page, where Burlington Contemporary can inform visitors and prospective authors about the journal, and its relationship with the Burlington Magazine. The user is guided to interact with Burlington Contemporary and contribute to future articles.